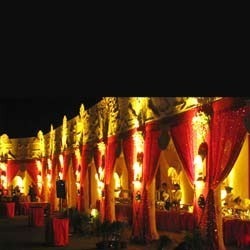 We hold expertise in offering our clients vast array of Wedding Catering Services in the market. Our services are well organized by experienced professionals, who have in depth knowledge in their domain. With the assistance of experienced chefs, we are able to offer mouth watering and lip smacking cuisines to our valued clients. Our kitchens are well equipped with advanced technologies and requisite facilities, which assist us to offer different exotic range of delicious food to our clients. Owing to 40 years of rich and appreciable experience, we are able to serve our clients with extensive catering services. Since 2005 we came into restaurant and industrial catering services. Our services include Anniversary Party Catering Services, Inaugurations Ceremony Catering, Wedding Catering Services, Corporate Catering Services, Theme Parties. Our catering services are highly demanded for exotic menus and also for different and wide range of cuisines. We are always ready to serve the demands of our valued clients whether they plan for a small birthday party or a big fat wedding. Our team of chefs is experienced and has vast knowledge about the cuisine round the world. Working in close proximity with the clients, our team is able to understand their specific demands and serve them with relevant services. Hence, deliver them maximum satisfaction in all the aspects.